is now available on Amazon’s Kindle Store. I’ve prepared a short 18-page pdf that contains the chapter-wise details of the book. 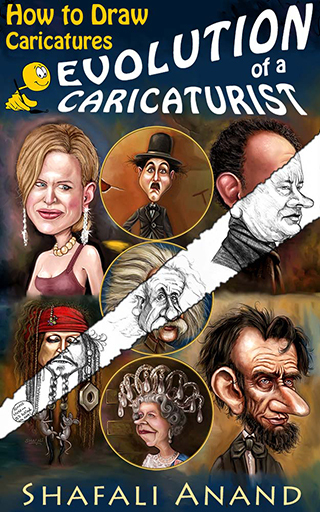 You can download this Free pdf for the ebook “Evolution of a Caricaturist” here. Chapter 14: Spread your Wings and Fly! Among all kinds of illustrations, caricatures are the ones that evoke the highest response from the audience. A caricature achieves this by weaving the spell of humorous likeness around its subject. This book establishes a logical method to harness the creative madness that results in caricatures. I call it the Feature Frame Method © and illustrate how this method can be used to selectively exaggerate every facial feature. This book helps you master the art of caricature drawing by presenting more than 70 artworks and technical drawings and analyzing the features of more than 30 celebrity faces. Each of your caricatures are just: Wonderful. I don’t have anything else to say. do you know where to get some books ?? Additionally, I’d recommend that you look at other books available on Amazon. Shafali i would really like to get my hands on your book evolutions is there any chance of you emailing me it thanks? Thankyou very much for the quick reply Shafali i look forward to the new and enriched edition… may i say have you tried uploading the ebook to http://www.scribd.com it is a brilliant place for literature. Hi Shafali. It’s amazing that you have not yet published this book! I think that many people are looking for a so wel-written handbook concerning caricatures drawing .Thanks for sharing your skills for free! If, one day, I’ll find this book in a bookshop I will buy it for sure. P.S. : note that the draw in the chapter about nose is not visible (I use Mozilla Firefox). I don’t know what’s wrong with the drawings on the Nose chapter…will check again. Thanks for letting me know. whats more after all the features ??? Dewey…you could wrap Gram around your left paw if you wanted:) Your Gram is a fantastic woman, who is very talented. You should talk to her sometime – pup-to-human! I do what I can – sometimes I feel that I’d be dead in about 5 years and so I have to do whatever I can and I want to…in this time – I think that’s what drives me.